South Korea’s overseas aid agency said Sunday it has donated two food-related facilities that will help upland farmers in the Philippines connect directly with consumers and contribute to the development of agricultural areas. The state-run Korea International Cooperation Agency established a regional local food terminal in San Miguel in Panay Island, which is expected to serve as a consolidation center for products from 11 municipalities of the island. Equipped with a refrigerated storage facility utilizing solar energy, the terminal will offer efficient ways of ensuring the quality and safety of agricultural products. Along with the terminal, the agency donated a local food center where Filipino farmers will be trained to strengthen their marketing ability and have meetings with consumer groups. 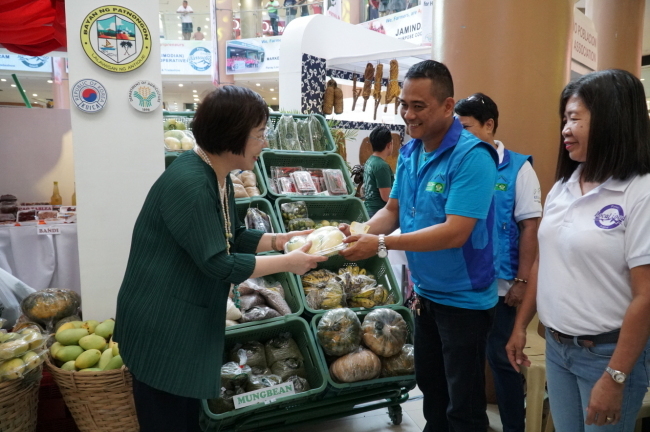 “The purpose of the project is to establish a sustainable development system run by farmers in the rural area, especially, upland, which remains on the outskirts of the benefits of development,” KOICA President Lee Mi-kyung said during a ceremony in San Miguel, Iloilo, on Friday. The event was part of the Panay Island Sustainable Rural Development Project, worth $6.5 million, funded by a grant from KOICA and implemented through Hankyong National University in Gyeonggi Province. The five-year project is currently in its third and final phase. It focuses on the promotion of local food marketing and building an integrated mechanism between marketing and finance as part of the local food system on the island.